pem2pfx – converts a .pem-formatted file containing a private key and signed certificate into a Windows-compatible .pfx certificate file. echo "Please specify a password below. Windows refuses to import a .pfx certificate with a blank password." echo "pem2pfx - converts a .pem formatted private-key and certificate file to an IIS-compatible .pfx file." The relatively new document types Office 2007 has given some web hosts problems when their clients want to offer documents for download. Most often, the documents are being offered by the web server as “text/html” which is then rendered as a ton of garbage on the web user’s screen. The best way to resolve this is to add all the MIME types to the server’s main configuration. IIS7 for Windows already has these MIME types set up correctly by default. IIS6 and IIS5 require the MIME types to be added, as might Apache on older installations. For Apache, there is also a workaround for the individual domain owner to add the mime types via Apache’s .htaccess file. Within the “Internet Information Services” tab (usually the only tab), ensure that the “Enable Direct Metabase Edit” checkbox is checked. Be sure to back up IIS’s configuration (di sini for IIS5) beforehand. I won’t take any responsibility for an admin breaking his server. I have reason to believe this may also work on IIS5 however I have just as much reason to believe that it might just give lots of errors. If an IIS5 / Windows 2000 admin is willing to test this for me after backing up your configuration please let me know of the results.
' This script adds the necessary Office 2007 MIME types to an IIS 6 Server.
' To use this script, just double-click or execute it from a command line.
' 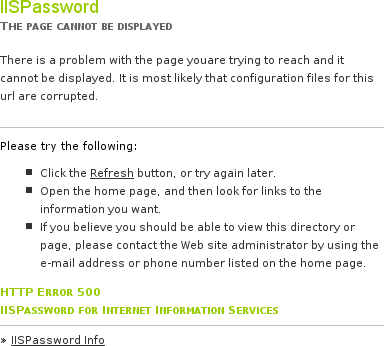 IIS MimeMap so you should not run it more than once. WScript.Echo "Microsoft Office 2007 Document MIME types have been registered." ' Get the mappings from the MimeMap property.
' Add a new mapping. Apache stores its MIME types in a file normally located at $installpath/conf/mime.types. See the mod_mime documentation for more on how it works. Arch Linux installs its MIME types at /etc/httpd/conf/mime.types dan Parallels Plesk installs it in /usr/local/psa/admin/conf/mime.types. Your distribution might have it in another place, so find your mime.types file by running locate mime.types. Some of you may already know that I built a home server not too long ago. I documented some of the very important parts of how it was built though I was planning on releasing all the documentation all at once. I was using Arch Linux and I hadn’t nearly finished everything, especially the documentation. Sebagai contoh, it was supposed to be a media server. After some disk shuffling, it was supposed to end up having a RAID1 for the boot and RAID 10 for the rest (the media part). This didn’t work out at all. I got as far as having an efficient (dan baik–firewalled) routing gateway server. I was finally satisfied that the customised local routing* was working correctly and I was confident that my tests with DHCP meant I could disable the DHCP service on the flimsy ADSL router and have all my flatmates start using the server as the Internet pintu masuk. Instead: I was logged in to the server from the office, I’d just installed Apache2**, and I was about to consult with a colleague regarding getting nice graphs put together so the flatmates could all see who was using up the bandwidth*** — when I noticed a little message indicating that the root filesystem had been remounted read-only due to some or other disk failure. And then I lost my connection to the server. And then I gained a foul mood. When I arrived home, I found that, as I had guessed from the descriptive message given at the office, the (sangat) old 80GB IDE disk that I was using for the root filesystem had failed. Unfortunately, the server would never boot again and there was little chance of prying everything off onto another disk to continue where I’d left off. * ISPs in South Africa charge less (easy price comparison) for “local-only” (within South Africa) traffic on ADSL but only if you use an ADSL account that CANNOT access web services outside of South Africa. This means that if you want to take advantage of the reduced costs but still be able to access the Internet at large, you need to set up some sneaky routing. *** Internet Access in SA is expensive – you get charged about R70 ($7 / £4.9 / €5.46) per GB when using ADSL, or about R2 per MB if using GPRS / 3G. I very recently found a problem with a client’s web site due to a .htaccess file. The site was hosted on a Windows server running IIS using IISPassword, which makes use of .htaccess files for its settings. If this were on a server running Apache with mod_rewrite, most web users would go directly to the correct site content. Only if they reached the site through the search engines and indexes listed in the .htaccess, would they be redirected to the siffy phishing url that the cracker wants victims to reach. Tricky pada Yang distro yang anda gunakan? dan mengapa?